Baseball is certainly popular in other Asian countries, including Taiwan. Assuming this Wikipedia article is correct, there have been 11 players born in Taiwan that have played Major League Baseball. The advantage that basketball has over baseball is that you can play basketball with two people, one ball and one hoop. Or you can go shoot by yourself. To play a reasonable game of baseball, you need more equipment, more people, and a bigger patch of ground. And it's pretty much impossible to practice by yourself. If baseball is going to grow in China (or Australia, or the Netherlands, or Italy, or inner-city Chicago), it's going to need organizational and facilities support from the government and MLB's (or NPB's) outreach organization. During the Cultural Revolution, Mao [Zedong] declared war against almost all Western bourgeois affections, from classical music to novels [to baseball], but he never wavered in support of basketball. Deprived of all forms of cultural enrichment and lacking the most basic athletic equipment, children and young adults roamed around their neighborhoods, setting up boards and hoops in alleys and courtyards and pouring their energy into the simple game of shooting the hoops. 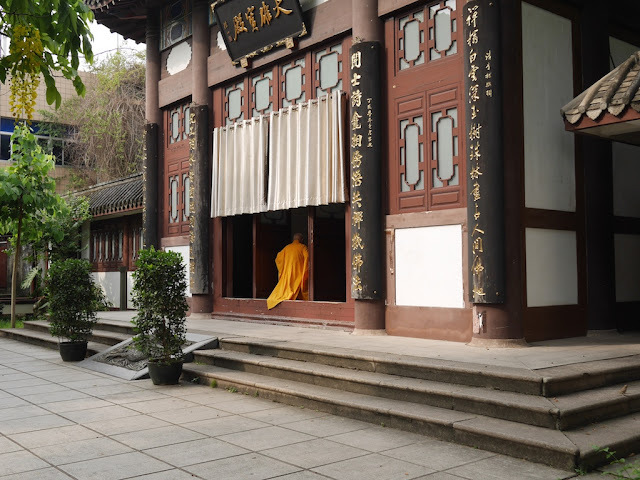 "At that time, China had basically only two sports: basketball and ping pong," my father, a teenager during the height of the Cultural Revolution and a devout basketball fan told me. "If you were young and loved sports, you only got these two to choose from." 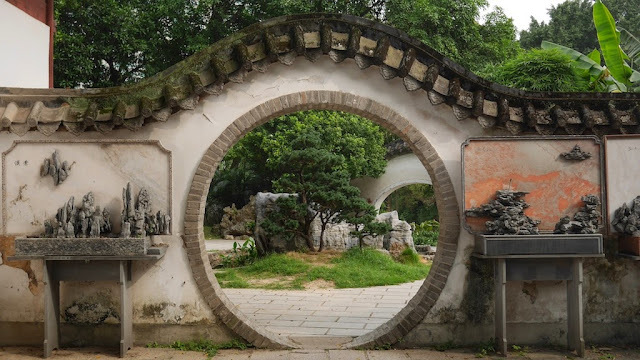 See Gao's piece for more about basketball's history in China and the roles political support and other factors have played in its growth. Of course, Confucius may have liked it too. I wonder if they considered turning off the Wi-Fi. The ethical man comprehends according to righteousness, the small man comprehends according to profit. "All the ethereal things about baseball -- no clock, the sacrifice, the journey around the bases that starts and finishes at home -- it all resonates in Chinese culture," said MLB vice president Jim Small, who oversees all of Asia. "I'm convinced that if baseball was around during Confucius' time, he would have been a huge fan." What would Confucius say? What would the NBA, far more popular than MLB in China, say? *Added note: Removed my first two lines because they could imply things I didn't intend to imply and had nothing to do with this post anyway. The crackdown on public-interest lawyers has tightened. Social-media sites have been subjected to tighter controls. Even those used to a degree of immunity have found themselves targeted. Foreign businesses have been alarmed by stepped-up corruption probes into pharmaceutical companies, dawn raids by antimonopoly regulators on firms ranging from Microsoft to Mercedes-Benz, and proposed antiterror rules that would require foreign software companies to hand over their encryption keys. New civil society laws have tightened restrictions on foreign NGOs. 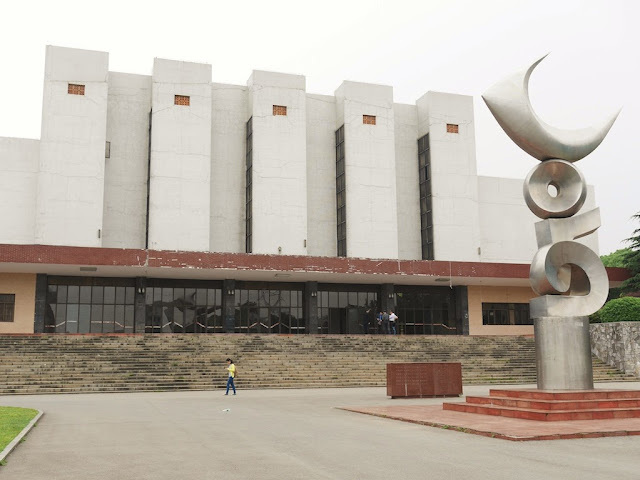 As of early 2015, central CCP organs had begun to speak of the need to “rectify” higher education, purge “Western values” from textbooks, and redirect art and architecture back toward traditional Chinese forms. All of this—the new stricter laws, the crackdown on non-governmental organizations, lawyers, bloggers, web sites, and journalists—is indicative of a government that does not have the situation under control, a situation that is unlikely to be helped by the recent stock market crash. Rarely is authoritarianism a signal of strength; instead, it stems from fear, paranoia, and panic . . . I think we need to consider a different possibility. Together with China’s assertive posture in territorial disputes, the adoption of a broad national security law, and proposed legislation that would place strict new limits on the Internet and activities by foreign non-profits, the mass detention of rights lawyers suggests to me that China’s leaders are so confident in their strength that they no longer need to maintain the pretense of limited engagement and tolerance. For now, I simply recommend the above three pieces. They offer plenty of food for thought. 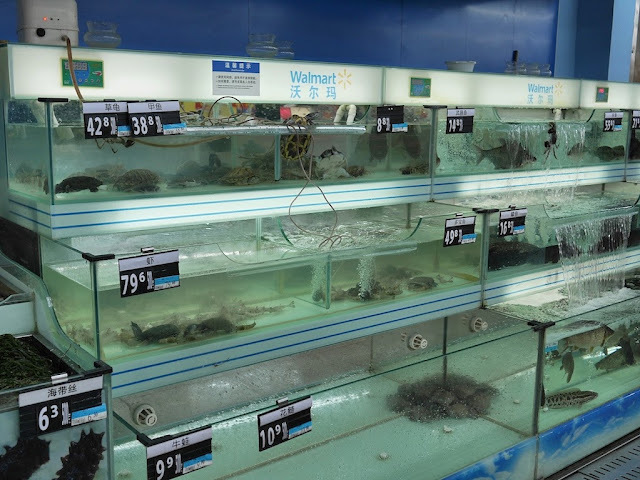 Earlier this year at a Walmart in Zhuzhou, Hunan, I saw a man removing a number of large fish from a tank. He seemed to be choosing those near death, if not already there. It was not what I would call a thriving fish community, and I wondered what would be done with the removed fish. I wasn't able to come back the next day to see if there was a special on spicy fried fish. 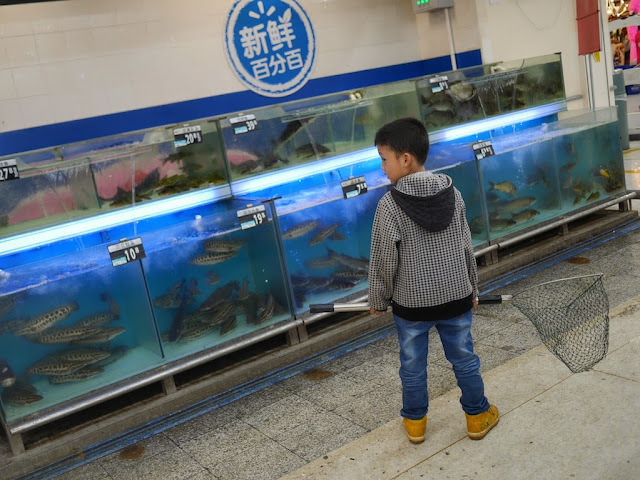 A couple weeks before that at a Walmart in Loudi, Hunan, I saw a boy who appeared interested in catching a fish. I wasn't able to stick around to see if he gave it a try. But at least most of the fish were swimming in a relatively normal fish-like manner. 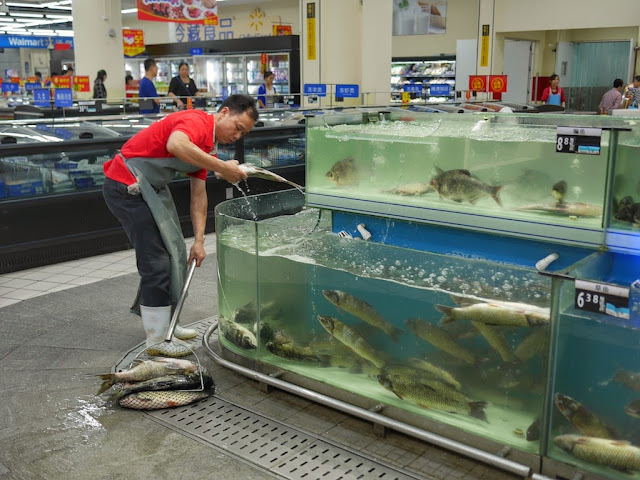 Although these scenes aren't as dramatic as an escape attempt I saw in Chongqing, they too capture some of how Walmart has localized its groceries in China. One day earlier this year in Chongqing, China, I unexpectedly witnessed two daring escape attempts. I waited to share the dramatic story to reduce the chance that either of the individuals would face additional repercussions. One escape attempt involved a plucky crab. The other involved a determined turtle. 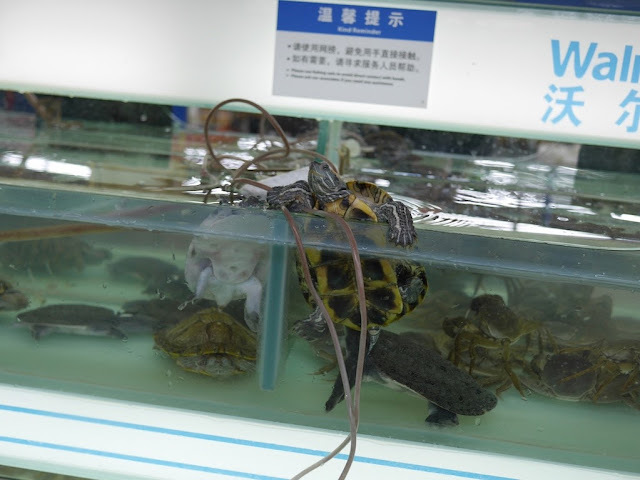 It appeared hopeless for the turtle with its short, widely spaced limbs to pull its heavier body out. 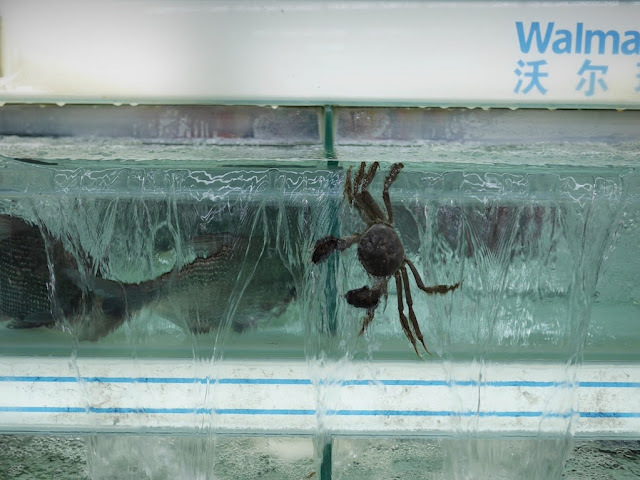 The crab fared better, possibly assisted by a higher water level, yet remained hanging from the tank's edge. Perhaps the crab realized that letting go wouldn't lead to much of an escape, since both it and the turtle were at the highest level of three rows of stepwise tanks. As they say, "Out of the frying pan into another frying pan". Or something like that. In this case, a frying pan likely isn't far off from their ultimate fate, which I assume has already occurred, since they weren't being sold as pets. May this crab and this turtle never be forgotten. They not only showed remarkable spirit, but they also demonstrated how the grocery section of a Walmart in China can be a bit more interesting than those in the U.S. The article doesn't explicitly say so, but it appears Perry did not intend his comment to be a compliment. Eric Mindich, a former Goldman Sachs Group Inc. partner who now runs hedge fund Eton Park Capital Management L.P., said the Chinese authorities had “plenty of ammunition” to keep the good times rolling. Some people wouldn't necessarily disagree with Mindich, with the caveat that keeping the good times rolling now could mean a bigger price to play later. Although we can see a few shadowy outlines of answers emerging as China’s reform odyssey continues, we still do not really know exactly where [President] Xi intends to take the nation. To look into his “Chinese dream” is to see an aspiration for a country that is wealthier, more powerful and better respected. If you look at Xi’s domestic policies it is possible to see an ominously Mao-tinged autocrat whose answer to most problems seems to be more discipline, controls and toughness. But there is little else. And so, because China will almost certainly remain caught between transitions for some time to come, the resolution of crises such as stock market crashes will remain an uncertain and parlous business. 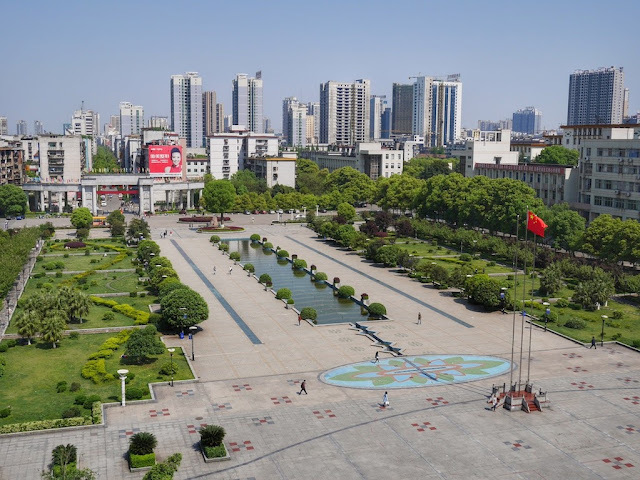 The Maoist toolbox into which Xi now seems to reach with increasing frequency when problems occur provides him with few suitable tools for handling many of the complexities of 21st-century economic markets. 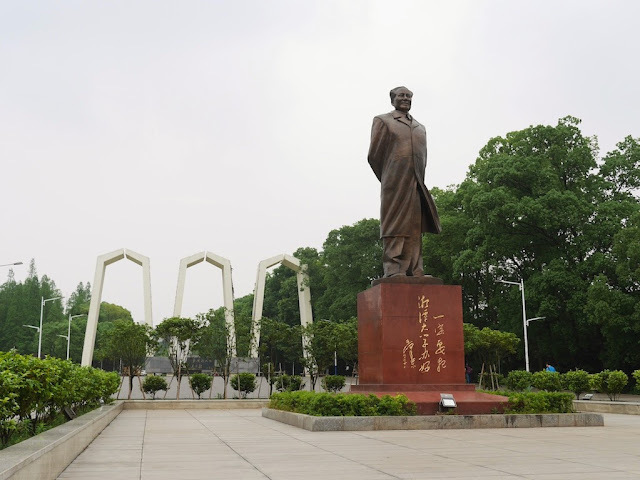 When I visited the University of South China in Hengyang earlier this year, I was surprised to see a familiar uncle. 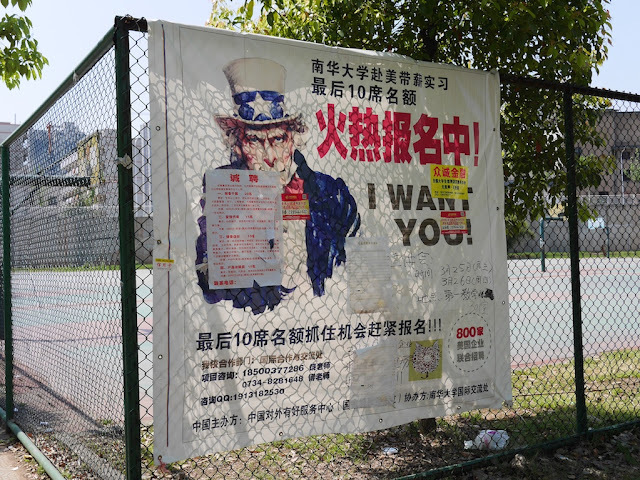 But Uncle Sam wasn't recruiting people for the U.S. Army Instead, the poster claimed to be advertising paid internships available in the U.S. 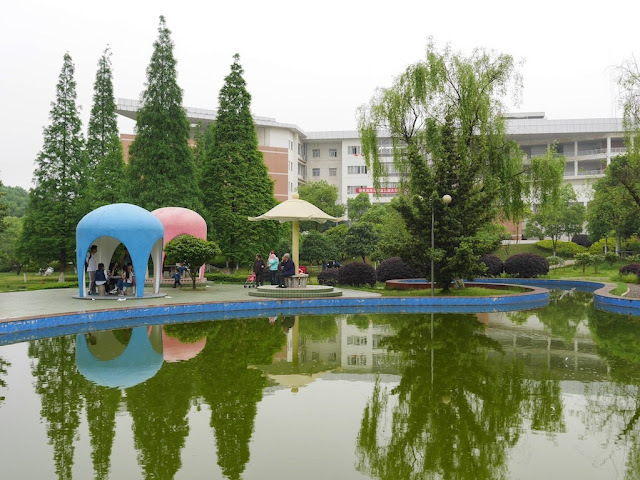 In the spirit of the shouts and photos of recent university graduates in China, I will share some photos I took during brief visits a couple of months ago to two universities in Hunan province — University of South China in Hengyang and Xiangtan University in Xiangtan. 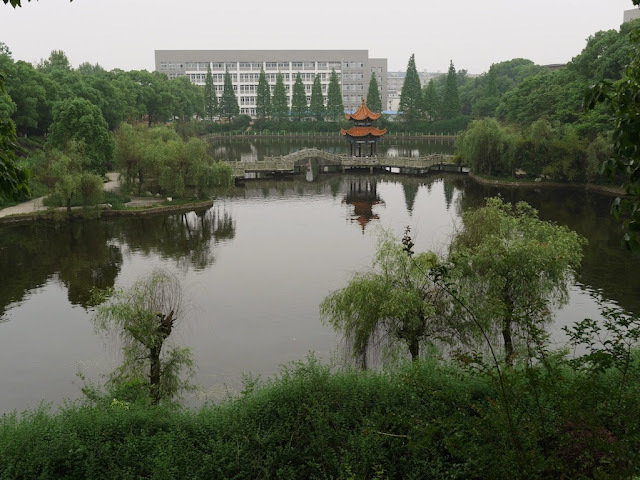 They are focused mostly on buildings and landscape and represent only a small part of each university. 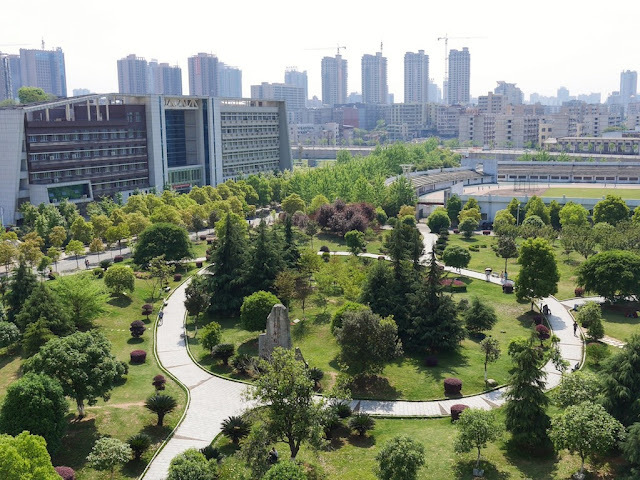 Many of the taller buildings in the background of the University of South China photos are from the surrounding neighborhood. 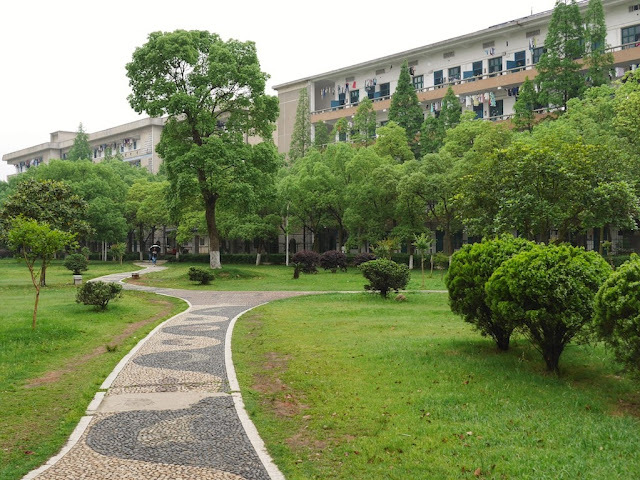 Like many other universities in China, Xiangtan University was not located in an urban area. 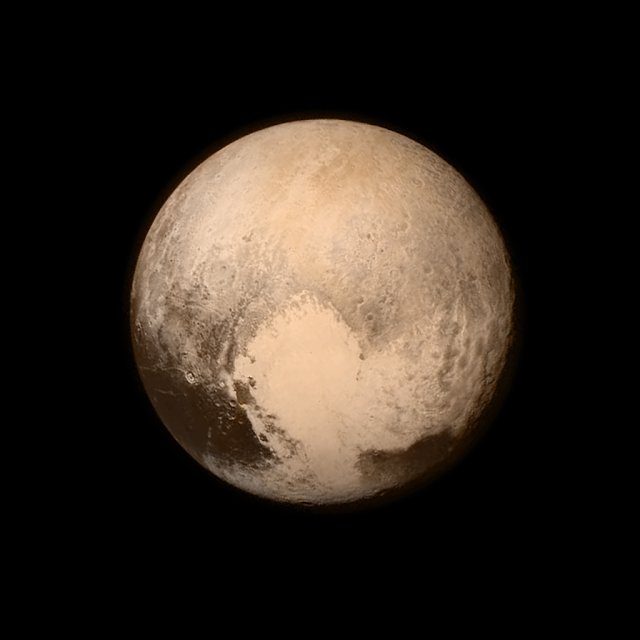 The image was taken before the spacecraft's closest approach and many more should be on the way if all goes as planned. 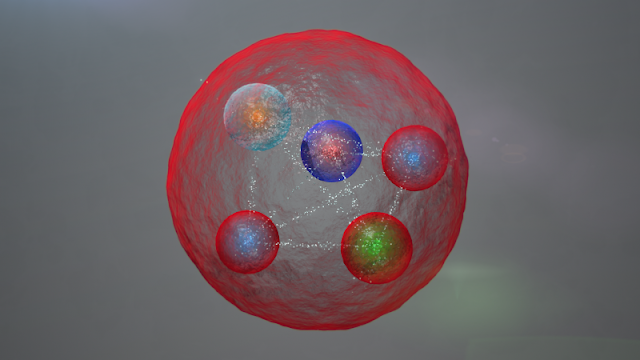 The LHCb experiment at CERN’s Large Hadron Collider has reported the discovery of a class of particles known as pentaquarks. The collaboration has submitted a paper reporting these findings to the journal Physical Review Letters. Once again, if you are having difficulties seeing the pentaquark, it is probably because I drew it to scale. This time the challenge isn't that the object is really, really far away, but that it is really, really small. For something easier to see, here is an illustrated representation, not to scale, of a possible layout for the quarks in a pentaquark. Compared to Pluto, though, it is far more complicated to talk about what a pentaquark "looks like". Suffice it to say here that our brains weren't built to interpret the world at such small scales, where the rules seem rather crazy compared to what we experience in our everyday lives. But strange stuff that defies our expectations isn't limited to the small. And these two examples of today's science are just a taste of the many exciting discoveries still remaining to be made whatever the scale. The winds of change have blown across Beijing yet again. 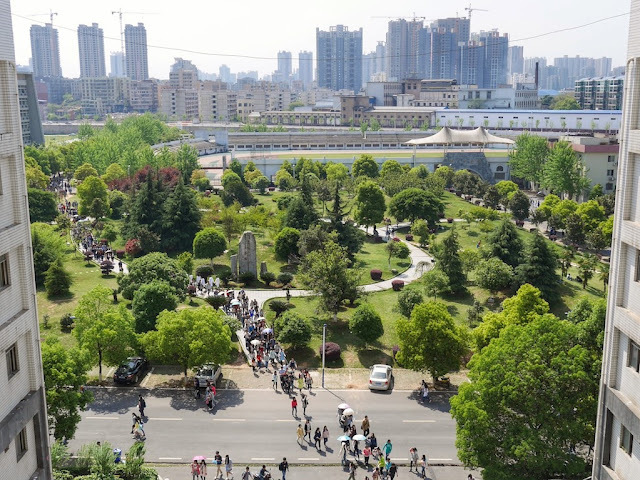 Not only did students at Tsinghua University School of Economics and Management not chant "revive the A shares, benefit the people; revive the A shares, benefit the people" at their graduation ceremony, but they also did not chant the updated slogan "Actions speak louder than words, shoulder responsibility, be innovative, benefit the people." Perhaps the university considered the point I made about the phrase "Actions speak louder than words". Cecilia Li in Sinosphere reports they instead shouted, "Tsinghua S.E.M., benefit the people!" It doesn't seem as poetic as the previous versions or as creative as pink ribbon graduation photos. Fortunately, slogans shouted by other schools proved to be a little more interesting. My favorite is the one shouted by the School of Information Science and Technology: "Compute lives! Compute the world! Compute the future!" I can't help but think that adding "Compute this!" at the end would have spruced things up even more. 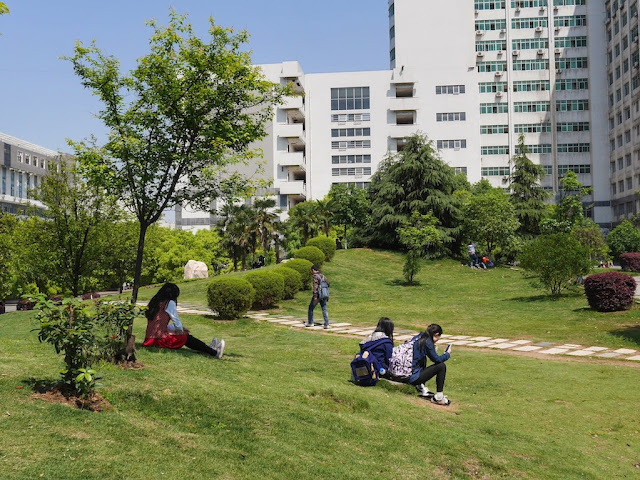 Recently, several college graduates wearing pink ribbons took photos in Shandong University to advocate the "International activity of breast cancer prevention" and commemorate their university lives. I would like to explain the symbolism, other than the color of the cloth, in the scene and how it relates to breast cancer awareness. I would like to explain the symbolism in the scene and how it relates to, well, anything. However, once again, I cannot. Graduates from Nanjing University of the Arts pose for a group of creative graduation photos in their ballet costume on June 30, 2015. The history of the university can be traced back to the year of 1912. I would like to explain why the date of the university's founding was mentioned. However, yet again, I cannot. 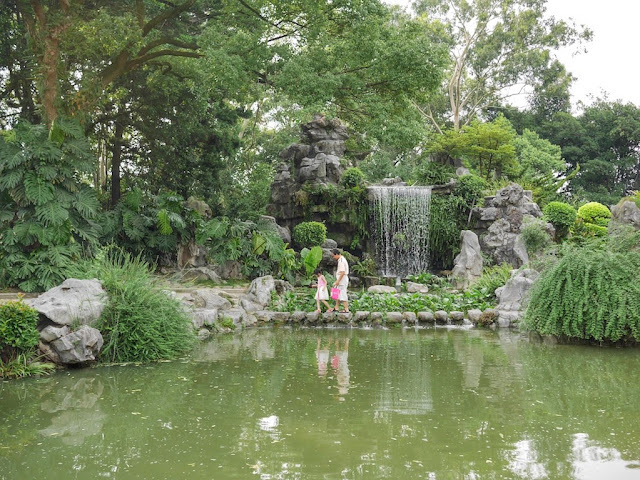 More relevant here is that both sets of photos are examples of a common practice in China — students finding fun ways to make graduation photos more creative and memorable. And in this respect, it is hard to argue with the results of either photo. I would like to explain why such photos receive the amount and type of attention they do from the People's Daily. I have some guesses, however . . . Yesterday I expressed hope to see a video of Tsinghua University graduates shouting "revive the A shares, benefit the people; revive the A shares, benefit the people" tomorrow as required by their school. Sadly, or happily, the event won't occur. The South China Morning Post reported today today that the slogan was originally submitted by students as a joke. 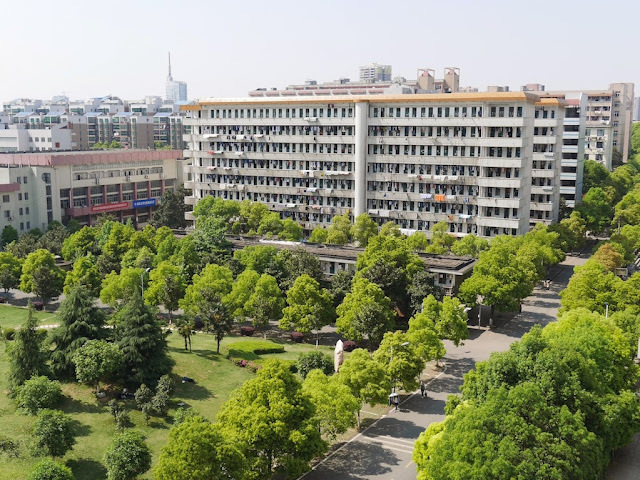 Although an official e-mail notice from the school stated students would be expected to shout the slogan, after news about it broke the school sent another notice stating that the slogan had not been officially approved. Some have suggested that the school had been playing along with the students' joke and was simply caught off guard when the issue became known to the public. Others don't buy that story and believe the school genuinely thought the slogan was a great idea. Congrats to this year's graduates all across China, whatever they may be shouting. Two things of note for today. They aren't related except in the sense of, well, maybe you can figure something out. 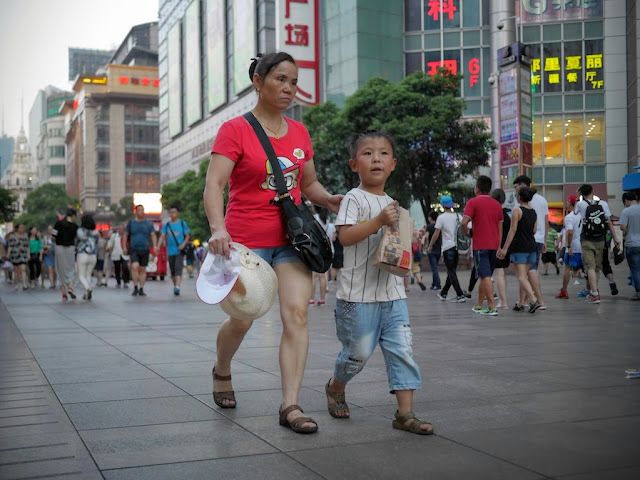 To mark the No Bra Day, volunteers call the public to pay attention to the breast health in Chengdu, southwest China's Sichuan province on July 9, 2015. Research indicates that wearing bra may increase the risks of getting breast cancer for a woman. There are no scientifically valid studies that show wearing bras of any type causes breast cancer. I hope there will be video. Somehow, I don't think the same slogan was chanted at any Occupy protests. 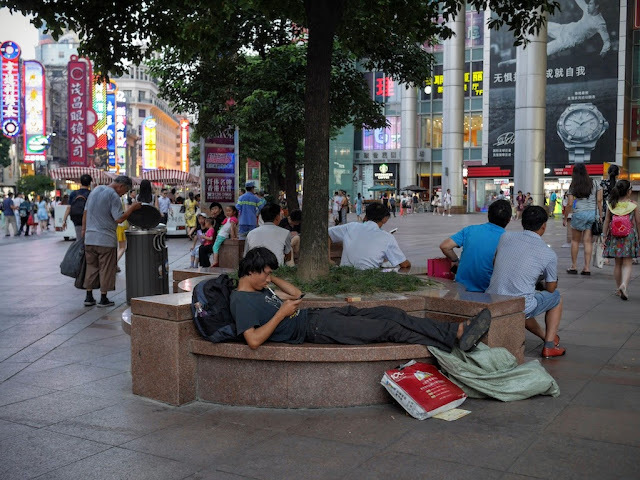 A large number of people seem captivated by China's stock markets these days. I have some thoughts on that topic, but I will instead cover something unrelated (unless you are especially creative in finding analogies) for a change of pace. 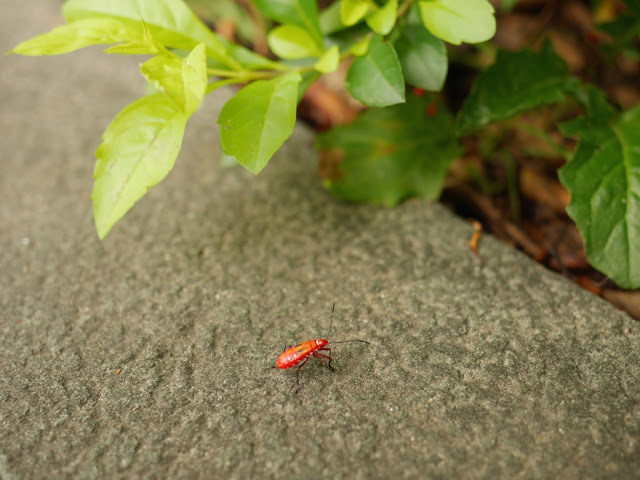 During my explorations in China and elsewhere I have come across a large number of creatures I have not seen before, often insects or arthropods, that I can't identify. In part, this is probably due to many relevant resources I find being focused on North American or European creatures. For example, I am still struggling to identify a creature I saw (and ate) in Cambodia two years ago, though I now have a lead to follow up. Fortunately, as with one type of giant centipede in Hong Kong, I sometimes have a much easier time. So today I will highlight another magnificent creature which has confounded me. If you can convincingly identify the species, you will win a prize of untold proportions. I would tell you the prize, but then the proportions will have been told. Since they are untold, this cannot happen, at least not yet. Please don't get excited about the proportions. Please do get excited about the creature. Below are two different individuals, I believe of the same species, I saw near the Kaihua Isle in Fuzhou. The length from the end of their body to the tip of their head was roughly equivalent to or slightly smaller than the diameter of a Chinese 1-jiao coin or a U.S. dime. They both ran rather quickly and did not appear to enjoy being photographed, despite me refraining from poking, eating, or criticizing either of them. 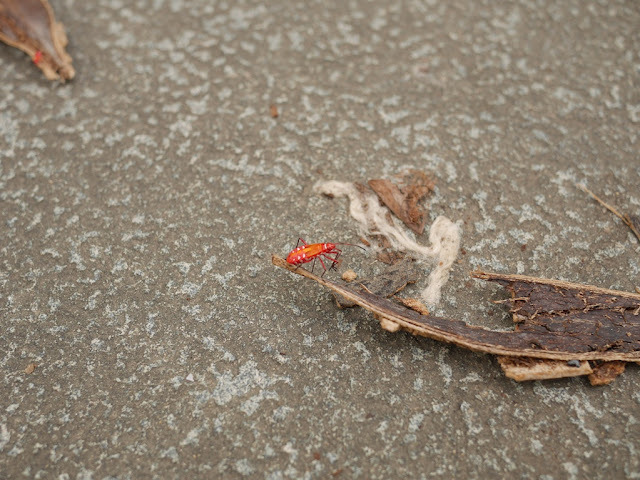 I would guess they are some sort of beetle, but I'm looking for something more specific. So, dear readers, what are they? 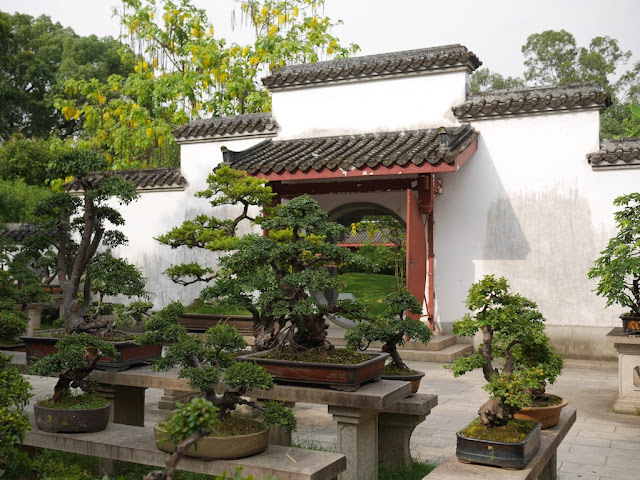 It is ranked 6th among the 36 west lakes all over China and wins its fame for verdant hills, sparkling waters, shady trees, grotesque rockwork and wooden pavilions. I have been to a number of those similarly named parks and wonder if I have been to the one ranked 36th. 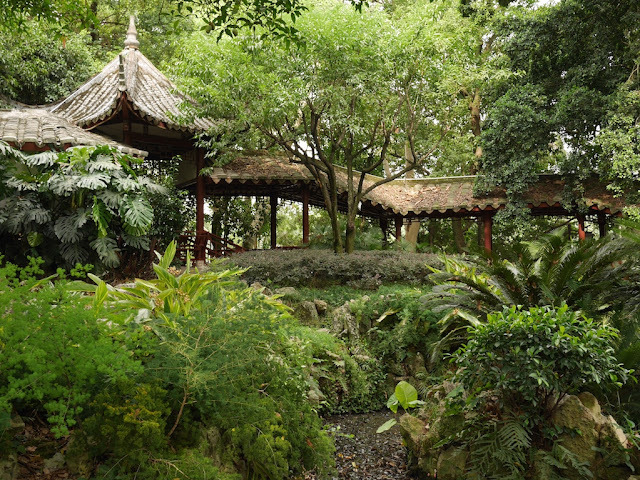 Whatever the case, I recently enjoyed a peaceful afternoon walking around the park in Fuzhou, and it wasn't hard to believe it deserved a top 10 ranking. 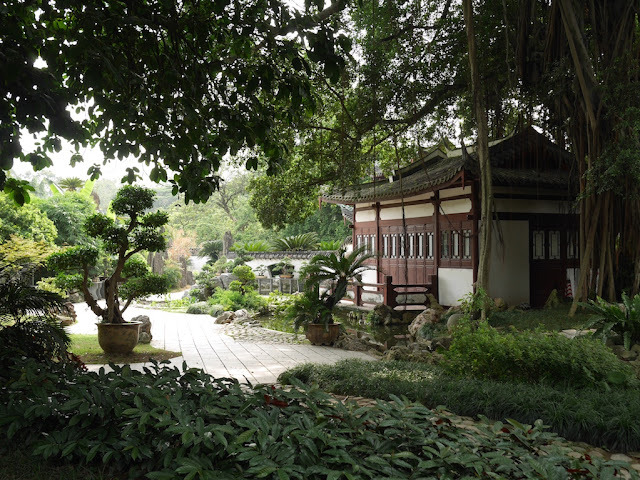 This post includes some scenes from its Kaihua Isle, the location of Kaihua Temple. 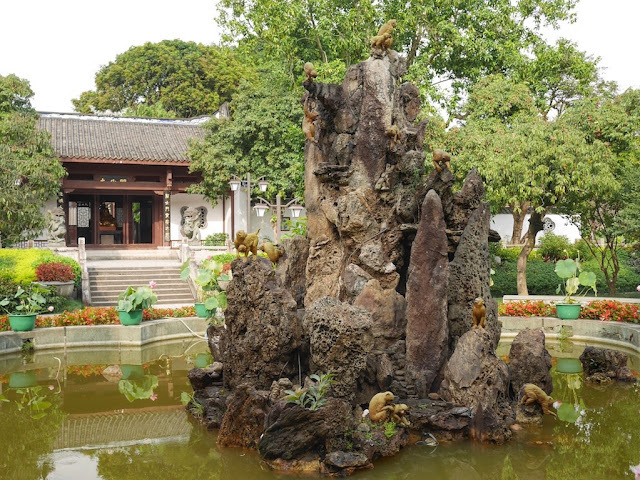 Tree penjing, sculptures of small monkeys, and a monk all make appearances. I had a post about July 4th in mind for today. Then this evening I read a piece published on that same day which speaks about the U.S. today and its history and also touches on much more. I have since been rereading it and thinking about its power, scope, and perspective. I think this is something best experienced with few or no teasers. "Letter to My Son" by Ta-Nehisi Coates. 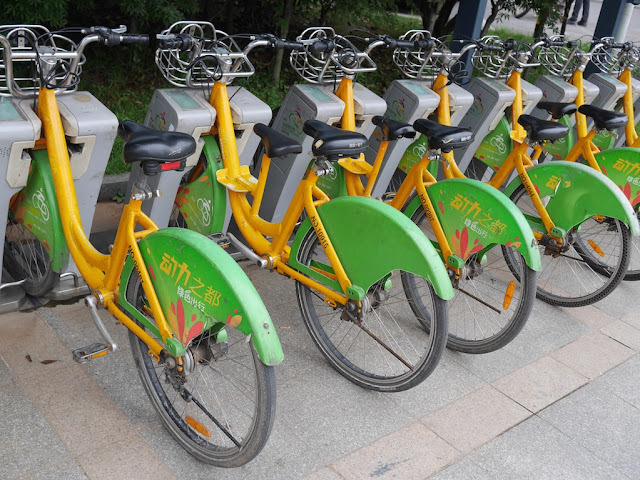 In 2011 Zhuzhou became the first city in Hunan province to operate a public bicycle rental system. 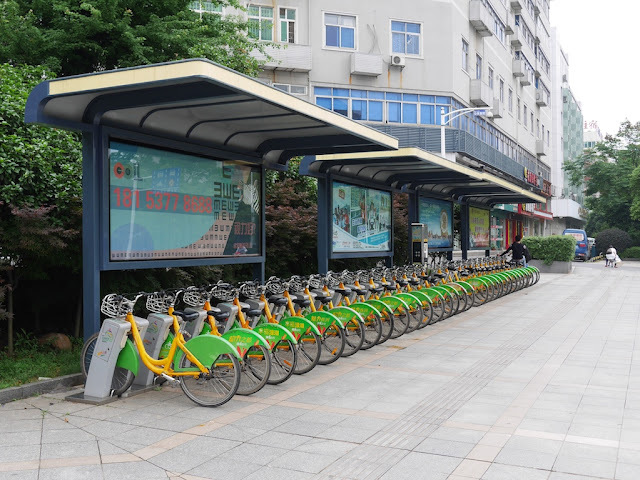 When I was in Zhuzhou a month or so ago, I came across a few of the many stations where city bicycles could be rented or returned. 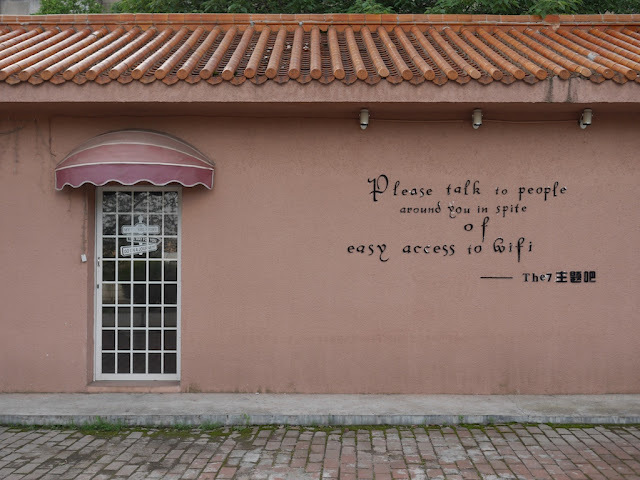 There is much which could be said about Zhuzhou's system. I will limit myself here to two things which especially caught my eye from a user experience perspective. One was that some of the bicycles available have a special feature: an added seat, presumably for a smaller rider. These bikes also have an extra bar, apparently for the second rider to hold. Since it is attached to the main handlebar, it is easy to wonder whether this could make steering the bicycle more difficult and present a safety issue. The other thing I noticed requires having a suitably sized block of wood or similarly strong object handy. Like the man in the above photo, if you prop up a docked bicycle, you have yourself a free stationary exercise device. 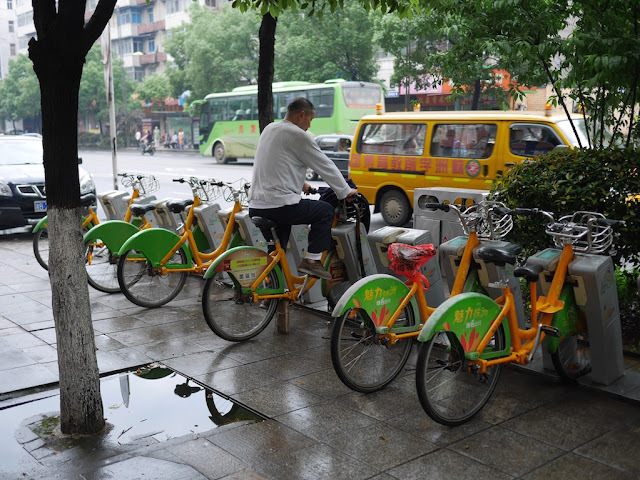 And unlike renting the bicycles for a less stationary ride, it won't cost you any money no matter how long you use it. 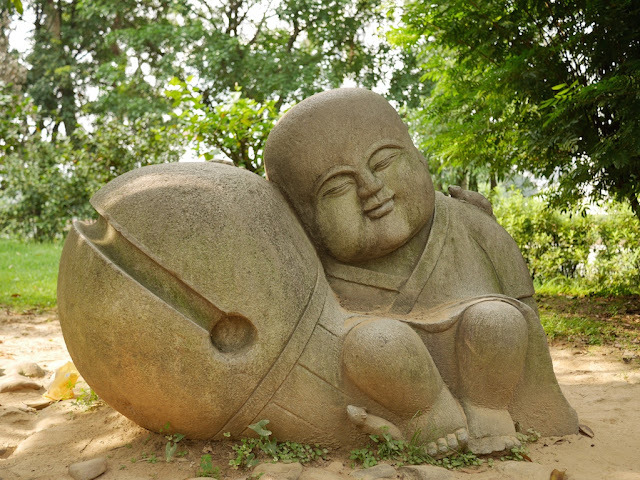 Today's piece of contemporary art comes from the Museum of Fujian Intangible Cultural Heritages in Fuzhou. 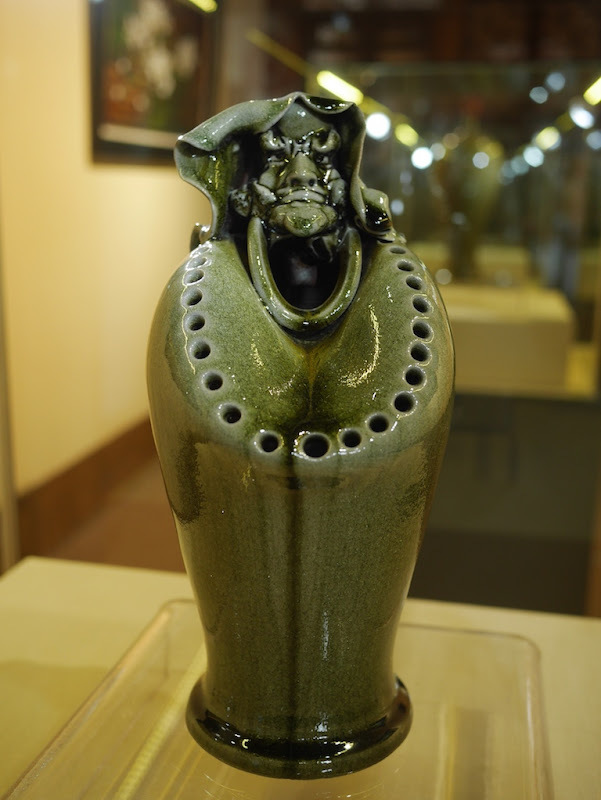 According to the museum, the artist is Chilong Ho (河志隆), and the piece is titled "Dharma Pot" (达摩尊).